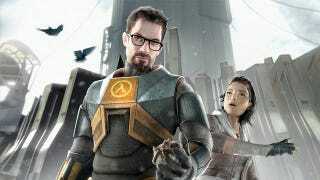 Is Valve About To Announce That They're Making A Movie? It's been one hell of a week for Valve rumors, but unlike the silly Half-Life 3 speculation that was floating around yesterday, this one seems plausible. The folks at Lambda Generation have discovered that Valve registered domains for "gamerlifemovie.com" and "gamerlifethemovie.com." Now this in itself might not be all that interesting—companies register domain names all the time—but in a new teaser for tomorrow night's episode of Game Trailers TV, host Geoff Keighley promises "the exclusive trailer for a new non-video game project in the works at Valve." Valve has been announcing all sorts of news this week, including a barrage of Team Fortress 2 and Valve Community updates. Is there room for another big announcement? We'll see tonight.